Multi-task learning enables us to train a model to do several tasks simultaneously. For example, given a photo was taken by a self-driving car, we want to detect different things in the image. Stop sign, traffic lights, cars etc. Without multi-task learning, we have to train model for each object we want to detect and with one output either the target object is detected or not. But with multi-task learning, we can have one model trained only once to detect if any of the target objects are detected by having 3 output labels. The model input is an image and the output has 3 labels, with 1 meaning a specific object is detected. For model trained on dataset like images, training one model to do multiple tasks performs better than models trained separately to detect objects separately since lower level images features learned during training could be shared between all objects types. Another benefit of multi-tasking learning is it allows the training data output to be partially labeled. Let's say instead of labeling previous 3 objects, we want the human labeler to labels 3 additional different objects in all given images, pedestrians, cyclists, roadblocks. He/She may eventually get tired and didn't bother to label whether or not there's a stop sign or whether or not there's a roadblock. So the labeled training output could look like this, where we indicate unlabeled as "-1". So how can we train our model with the dataset like this? The key is the loss function we want to "mask" labeled data. Meaning for unlabeled output, we don't consider when computing of the loss function. Let's walk through a concrete example to train a Keras model that can do multi-tasking. For demo purpose, we build our toy datasets since it is simpler to train and visualize the result. Here we randomly generate 100,000 data points in 2D space. Each axis is in the range from 0 to 1. To make the problem more complicated, we will simulate the labeler to drop some of the output labels. # Mask for missing label. Here is the important part, where we define our custom loss function to "mask" only labeled data. Then during computing the binary cross-entropy loss, we only compute those masked losses. Training is simple, let's first reserve the last 3000 generated data for the final evaluation test. Then split the rest data into 90% for train and 10% for dev during training. After training for 2000 epochs, let's check the model performance with our reserved evaluation test data. To help visualize what the model is thinking, let's plot its decision boundary for each of our 3 labels. If you are not convinced of the effectiveness of our custom loss function, let's compare them side by side. 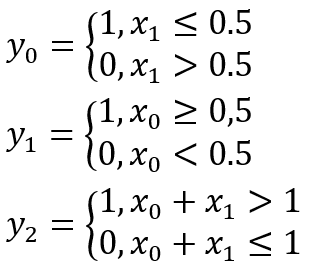 To disable our custom loss function, simply change the loss function back to the default 'binary_crossentropy' like this. Then run the model training and evaluation again. It finally evaluated accuracy is only around 0.527 which is much worse than our previous model with custom loss function. Check out the source code on my GitHub repo. With Multi-task learning, we can train the model on a set of tasks that could benefit from having shared lower-level features. Usually, the amount of data you have for each task is quite similar. Some degree of missing labels in training data is not a problem, which can be dealt with a custom loss function to mask only labeled data. We can do so much more, one possible dataset that came to my mind is the (MBTI) Myers-Briggs Personality Type Dataset. The Input is the text a given person posted. There are 4 output labels. We can treat each one as a binary label. We can allow the labeler to leave any personality type unlabeled for a given person's post. The model should still be able to figure out the relationship between the input and output with our custom loss function. If you have tried this, leave a comment below and let us know if it works.